In 1796, as George Washington set the precedent for a peaceful, democratic transfer of power, he also set a precedent by penning a farewell address to the American people. And over the 220 years since, many American presidents have followed his lead. 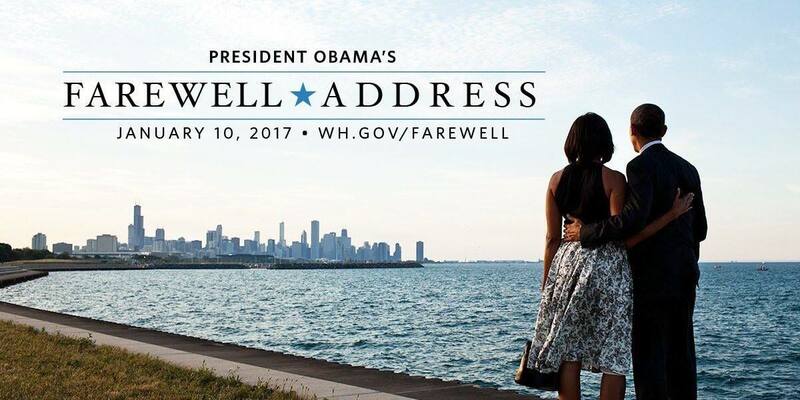 On Tuesday, January 10, I'll go home to Chicago to say my grateful farewell to you, even if you can't be there in person. I'm just beginning to write my remarks. 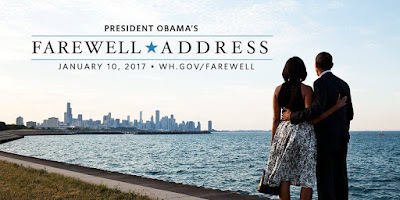 But I'm thinking about them as a chance to say thank you for this amazing journey, to celebrate the ways you've changed this country for the better these past eight years, and to offer some thoughts on where we all go from here. Since 2009, we've faced our fair share of challenges, and come through them stronger. That's because we have never let go of a belief that has guided us ever since our founding—our conviction that, together, we can change this country for the better. So I hope you'll join me one last time. Because, for me, it's always been about you.